In 1992, an international horticultural exhibition was held in Columbus, Ohio. The event was planned so large that they brought in an antique Loof carousel to grace the grounds of Columbus's Franklin Park and Conservatory Botanical Gardens. The festival looks like it was pretty neat. According to National Carousel Association, the carousel dates back to 1895 and was installed at Fair Park in Dallas, Texas. From there it went to the famed Pacific Ocean Park in Santa Monica, CA, a park that was utilized for the filming of multiple famous tv shows and films, including the finale of The Fugitive tv series and one of my favorite episodes of The Twilight Zone "In Praise of Pip," in which Jack Klugman stars and acts as a father who was distraught from finding out that his son was injured and likely to die in Vietnam. The carousel would continue on to travel to Spanaway, Washington State, then make two stops in Oregon at the Wilamette and Lloyd Centers. 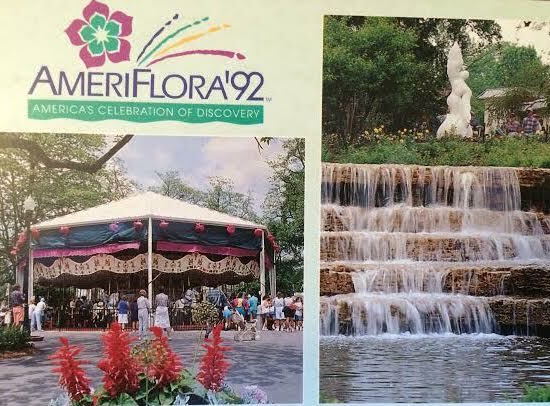 In 1992, the carousel was in Columbus for the AmeriFlora festival. It sat in storage for five years until it was reassembled in Burbank, California at the Media City Center, and then it was moved to its current location in 2004 to the Seaport Village in San Diego, CA. If you are looking for a great gift for someone or yourself, our 2016 Roller Coaster Calendar is now available through this link.